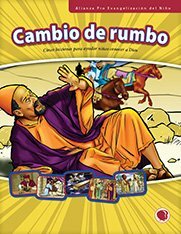 This five-lesson evangelistic series covers Zacchaeus, Mephibosheth, Noah, Saul and the Ethiopian treasurer. 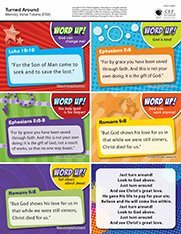 In each lesson children will be taught about God’s love, their need for a Savior, the person and work of Jesus and His invitation to become a child of God. View demonstrations of complete lessons, music and more! 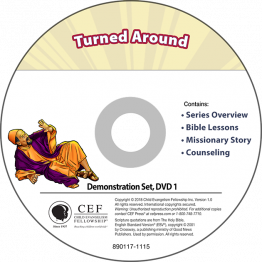 Full-color flashcard visuals to teach five lessons for this topical series Turned Around. 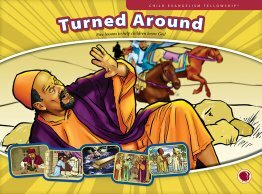 Additional resources for this lesson series: verse visuals, verse tokens, music CD and Demonstration DVD. Lesson text for this five part evangelistic series Turned Around. 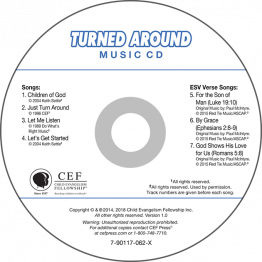 Songs on this CD are recommended in the Turned Around lesson series. Children of God, Just Turn Around, Let Me Listen, Let's Get Started. 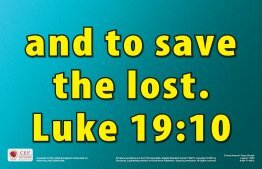 Bible Verse Songs (ESV): Ephesians 2:8-9 (By Grace), Luke 19:10 (For the Son of Man), Romans 5:8 (God Shows His Love for Us). 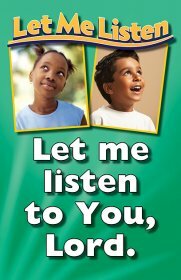 Children can sing this visualized song as a prayer, asking God to help them listen to what He wants them to know and do.